Aug. 5, 2015, 12:17 p.m.
What happens when you open a new tab in your web browser? Use this Chrome extension, you’ll see a stunning new satellite image from Google Earth. This one and you’ll see a stunning new…picture of One Direction. Or use this one (as I do) and you’ll see a randomized selection of Google Fonts and a custom color palette — just the sort of thing that might fire up some design creativity. For people at their desk all day, the New Tab screen in their browser might be one of their most viewed pieces of digital real estate. So what if you tried sneaking some news into it? 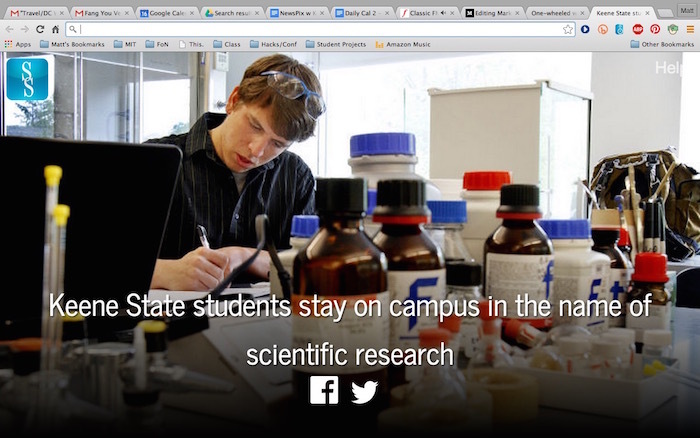 That’s the idea behind NewsPix, a new Chrome extension from MIT’s Future of News initiative. (MIT’s Matt Carroll and Emerson College’s Catherine D’Ignazio and Jay Vachon are involved.) Install it and each new blank tab will be filled with a big news image and a link to a news story. Newspapers are physical objects that remind readers they exist. A digital news site? Not so much. What reminds people it exists? Yes, there are newsletters and alerts. And yes, people might tweet and Facebook your stories. If they remember. But as the editor or publisher of a news site, you want to remind readers that you exist more often than that. Why not several times, maybe a dozen times, a day? NewsPix regularly reminds people that you exist and offers them a chance to visit your site. Think about how newspapers sell themselves: Walk into any corner store or pharmacy and you see a stack of newspapers. That casual, passive experience — simply seeing a paper sitting there — helps market the news brand. There’s a sample version of the extension using photos from New Hampshire’s Keene Sentinel. The most obvious limitation of NewsPix is that it’s a Chrome extension. Carroll says they’re planning on expanding to Firefox, but getting someone to install any sort of browser add-on is a high bar. And they don’t carry over to mobile. But it’s nonetheless an interesting idea — how can you replace the ubiquity of physical presence in a digital space? Benton, Joshua. "This new tool adds a little news to your web-browsing life every time you hit Ctrl-T (or ⌘-T)." Nieman Journalism Lab. Nieman Foundation for Journalism at Harvard, 5 Aug. 2015. Web. 19 Apr. 2019. Benton, Joshua. "This new tool adds a little news to your web-browsing life every time you hit Ctrl-T (or ⌘-T)." Nieman Journalism Lab. Last modified August 5, 2015. Accessed April 19, 2019. https://www.niemanlab.org/2015/08/this-new-tool-adds-a-little-news-to-your-web-browsing-life-every-time-you-hit-ctrl-t-or-%e2%8c%98-t/.